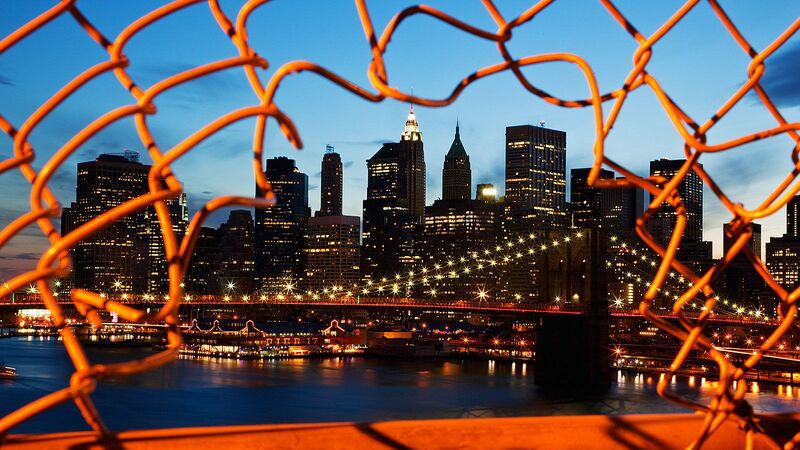 To truly discover the soul of this city, you’ll have to look beyond its historic center. Walking on the Pescaia di Santa Rosa, a dam that juts into the Arno River on the Oltrarno banks. I did not expect to fall for Florence while eating a Japanese dumpling. Like most first-time visitors to the storied Italian city, I’d arrived with the itchy fervor of a museum-goer, believing transcendence would be delivered by seeing in person all the Renaissance glory I’d encountered in photographs. Michelangelo’s David. Brunelleschi’s Duomo. Botticelli’s Primavera. The Ponte Vecchio and Palazzo Pitti. I spent my first 48 hours in a manic whirl, pinballing through the terra-cotta maze in the hot May sun, working through the requisite to-do list with surgical efficiency. Yet in this blister-inducing gorge on Medici-era splendor, I couldn’t shake the sense that I’d made the very mistake I’d vowed to avoid: seeing plenty but savoring little, skimming the city’s surface at the expense of understanding its soul. Then, on my third evening, came the dumpling. I was in Sant’Ambrogio, a sleepy neighborhood on the fringes of the tourist-clogged center, dining at the bar of a tiny restaurant called Ciblèo. Opened in March 2017, it is an enthralling spot with only 16 seats that bills itself as “Tuscan Oriental.” There is no menu; instead, diners sit for a languid, omakase-style feast of tapas that mixes Japanese, Chinese, Korean, and Italian flavors with elegant simplicity. Edamame and wild field peas arrived drizzled in spicy olive oil; a fatty sliver of soppressata shared a plate with a wasabi-infused potato; glasses of local wine gave way to sips of sake. The dumpling, perfectly steamed, its delicate skin pinched around a stuffing of Casentino pork, arrived in the middle of my meal. It was beyond delicious, a bite-size reminder that Florence is far more than a dazzling reliquary. 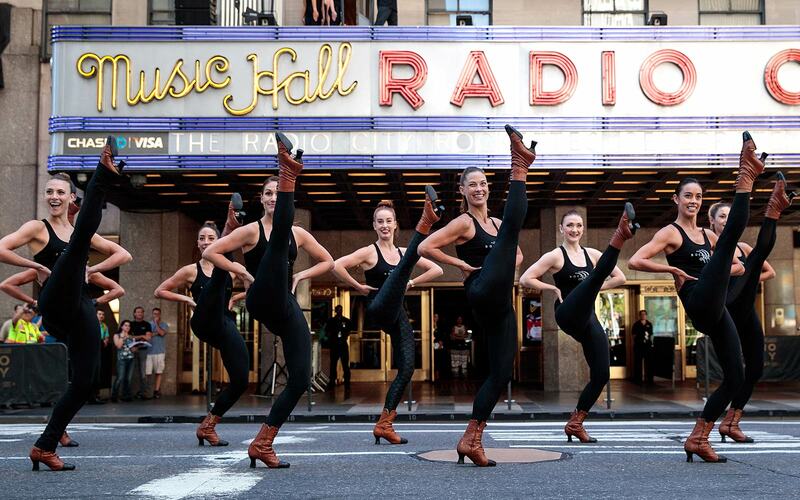 It’s a city opening itself to the modern world in surprising ways. 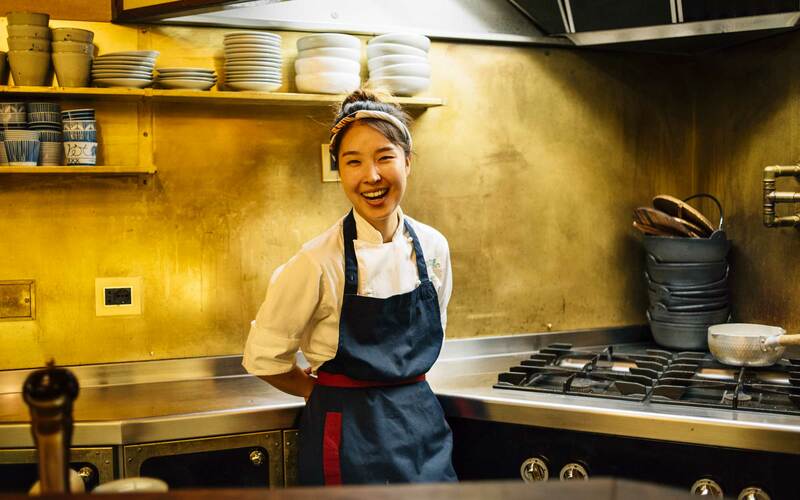 Minjoo Heo, a chef at the Asian-Italian fusion restaurant Ciblèo. “It’s quite special, is it not?” said Fabio Picchi, Ciblèo’s owner, ostensibly referring to the dumpling, though I’d like to think he understood I was having a revelatory moment about his hometown. Florence is more popular than ever, with some 16 million people visiting annually. Even so, you hear a lot of talk from locals about how it’s misunderstood, even undiscovered. 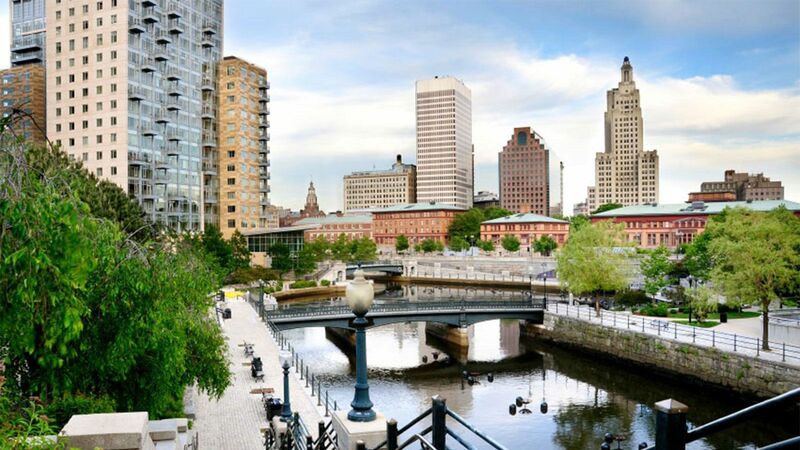 The sheer volume of crowds can make it easy to forget that the city is a living, breathing home to more than 380,000 residents. Before my meal at Ciblèo, I met up with Dario Nardella, the youthful, quick-witted 42-year-old who has been mayor since 2015. 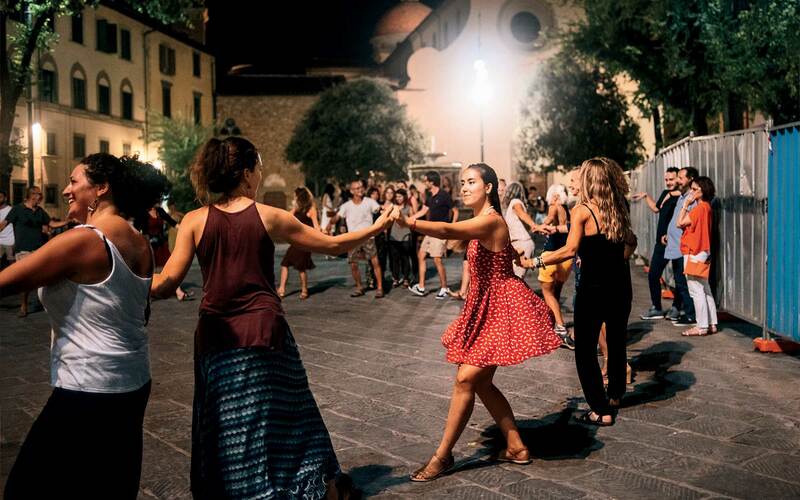 Like just about everyone you meet in Florence, Nardella is worried that the city’s heritage and culture—the centuries-old pursuit of those “wild fantasies” that once made the place a hub of civilization—are at risk of being diminished by mass tourism. 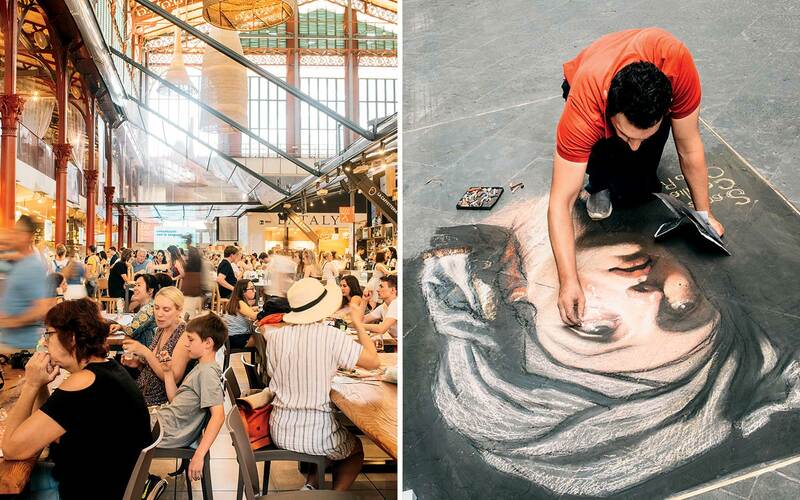 From left: The food halls at the Mercato Centrale; a street artist reproduces Guido Reni’s Saint Cecilia in chalk. This mentality has led to an ambitious revamping of Florence’s cultural programming. The new opera house, for instance, is an unapologetically modern, Cubist-inspired structure that stands out with giddy defiance in a city famous for looking much the way it did centuries ago. The Uffizi Gallery, Italy’s most popular museum, has been in the midst of an overhaul since 2015, when Eike Schmidt took on the role of director. A studious German, he is the first non-Italian to hold the post, and has been working to streamline the ticketing process, shorten the notoriously chaotic lines, and improve the flow through the halls so visitors can better appreciate the exquisite Botticellis and Raphaels for which the museum is famous. This remains a herculean task, as I discovered when I attempted to visit. Overwhelmed by the mosh pit outside, I opted to pass. But the Uffizi, for all its world-class holdings, is hardly the whole of the city’s offerings. Palazzo Strozzi, Florence’s contemporary art foundation, opened nearby in 2006. Many regard its 2016 retrospective on Ai Weiwei, the second-most-attended exhibition in the city’s history, as the moment Florence reestablished itself as a prominent force in the global art community. When I visited, a major survey of the video artist Bill Viola was all the more provoking for being set in a palace built in 1538. Wandering through the magnificent chambers was a transporting delight. The space was full but hardly frenzied; I didn’t have to dodge a single selfie stick. Having spent my first two days attempting to mainline all things Florence, I took a different approach the rest of the week: settling in, ambling about, letting conversations with locals serve as my primary guide. A headstrong people understandably proud of their roots, Florentines are by no means averse to making sure you visit the city’s mainstays, like the Mercato Centrale, a bustling market that’s been in operation since 1874. But even here a compelling dialogue between past and present has begun to play out. While the ground floor remains a time warp of fish-, cheese-, and produce mongers, in 2014 a mezzanine was added with stalls serving everything from esoteric beer to truffle pasta. Still, I found that Florentines reserved their greatest enthusiasm for newly opened places that don’t feel beholden to the past, like La Ménagère, a restaurant in the center that many locals mentioned as the sort of establishment that was unimaginable until recently. 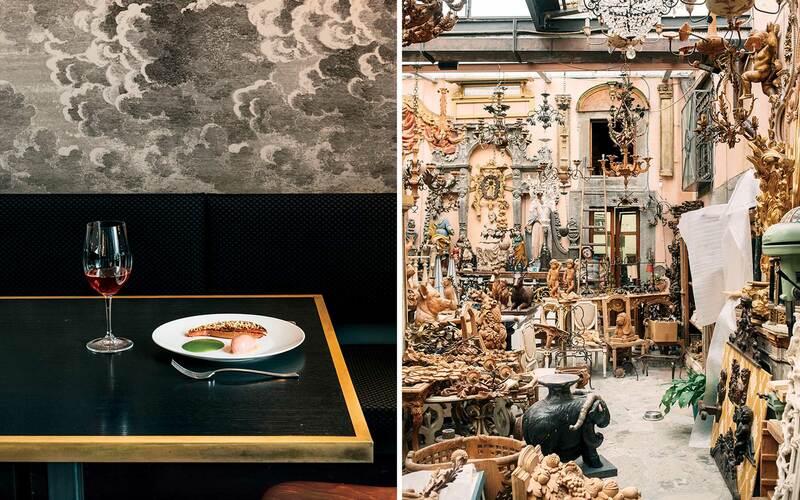 In an airy, sophisticated space of exposed plaster walls and dangling ferns, a multitude of worlds collide: fine dining in the back, a casual bistro in front, a craft cocktail lounge underground—not to mention a florist and a shop selling home goods. I arrived expecting a quick lunch. But after an octopus salad and spaghetti with anchovies, both sublime, I found myself seduced into sticking around for a glass of wine, then an espresso. By the time I left, the sun was setting. 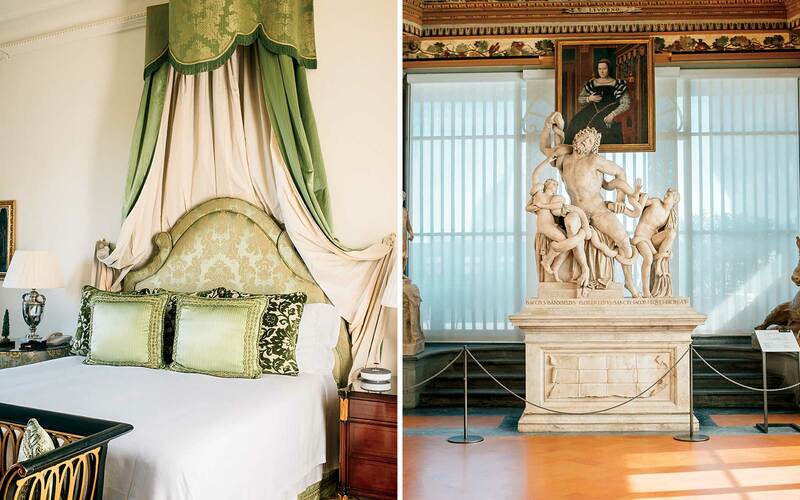 From left: A guest room at the Four Seasons Hotel Firenze, housed in a 15th-century former palace; Baccio Bandinelli’s 16th-century copy of a Hellenistic statue of Laocoön and his sons in the Uffizi Gallery. My accommodations certainly helped me absorb the city in a more languorous manner. Florence has lagged behind its larger European counterparts in offering the sort of hotels that encourage extended stays, but this, too, is changing. I spent the first half of my week at the Four Seasons, which opened in 2008 in a former 15th-century palace. With its original frescoes, outdoor pool, and large private garden, the hotel provided the singular experience of living, literally, like a prince. Then I switched to the Gallery Hotel Art, a sleek, whitewashed boutique establishment at the foot of the Ponte Vecchio where the lobby doubles as a showcase for modern art—a Warhol exhibition, when I visited. The hotel is one of a number of uniquely urbane properties operated by the Lungarno Collection, the hospitality arm of the Ferragamo empire. Another, the nearby Hotel Continentale, is a winking throwback to 1950s Italy. 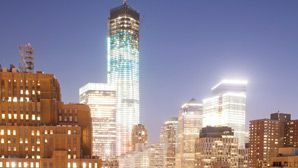 It offers one of the city’s best rooftop bars, which I visited several times to sip an aperitif while watching the sun dip behind the majestic skyline. I thought about this sentiment often while exploring Oltrarno. Located across the Arno opposite the city center, this is Florence’s “Left Bank,” a swath of labyrinthine streets where I got the distinct sense that the city’s residents are as keen on asserting themselves as their mayor. Poking my head into the minuscule storefront studios of the old-school leather craftspeople, cobblers, and papermakers who have worked in the area for centuries often led to impromptu tutorials on their work and technique. Oltrarno is also the most compelling neighborhood for eating and drinking. The area around Piazza Santo Spirito, a small square that turns into a nightly gathering spot, has become a showcase for budding chefs challenging the city’s reputation for stagnant cuisine. Folk dancing in the Piazza Santo Spirito, in Oltrarno. The anchor of this new food scene is Il Santo Bevitore, where dishes like roasted pigeon with foie gras ice cream are served in an unfussy, boisterous room; the restaurant recently added an adjacent wine bar, Il Santino. I ate one of my most memorable meals at Gurdulù, a modish, dimly lit spot on a quiet street. After a gin and tonic that arrived with a sprig of lavender suspended in a hand-cut ice cube, I ordered the tasting menu, leaving my meal to the whims of chef Gabriele Andreoni, whose obsession with unexpected ingredients shone in a cuttlefish salad with apricot bottarga and a succulent duck breast accented with kumquat and wasabi. Great cities impress in seconds but seduce slowly; Florence is no different. On my last day, I visited Numeroventi, a co-living space for artists that I would never have heard of had I spent only a day or two in town. Cofounded by Martino di Napoli Rampolla, a 28-year-old Italian, and Andrew Trotter, a peripatetic designer from England, it opened in 2016 in a converted palace built in 1510. The organization invites artists, writers, and designers for residencies lasting one to eight months. Once a week it opens to the public for studio visits, a throwback to the days when the elite popped in on the likes of Leonardo da Vinci; the completed works are displayed in monthly exhibitions. To help fund the enterprise, Numeroventi rents out a handful of impeccably designed apartments on Airbnb, making it arguably the choicest (and still secretive) place to stay for travelers eager to be immersed in the city’s latest scene. Ricciardelli led me through the studios and shared kitchen, absurdly gorgeous spaces where ornate plasterwork and frescoes contrasted with Modernist furnishings. We walked down a hallway lined with precise drawings of sound waves; on the floor below them were abstract renderings of the same shapes carved from marble. Both were the work of Lorenzo Brinati, an Italian artist and former resident. The top floor still looked much the way it did during the decades when squatters occupied it: dingy, with peeling paint, yet enticing given what was happening there. “Basically, this is a kind of free-for-all gallery,” Rampolla said, explaining that artists were invited to use the rooms however they saw fit: painting on the walls, experimenting with mischievous installations. It was the opposite of a museum. From left: A salad of Belgian endive, sorbet, and samphire sauce at Gurdulù, a recent addition to the Oltrarno dining scene; Bartolozzi e Maioli, a wood-carving atelier in the Oltrarno neighborhood founded in 1938. 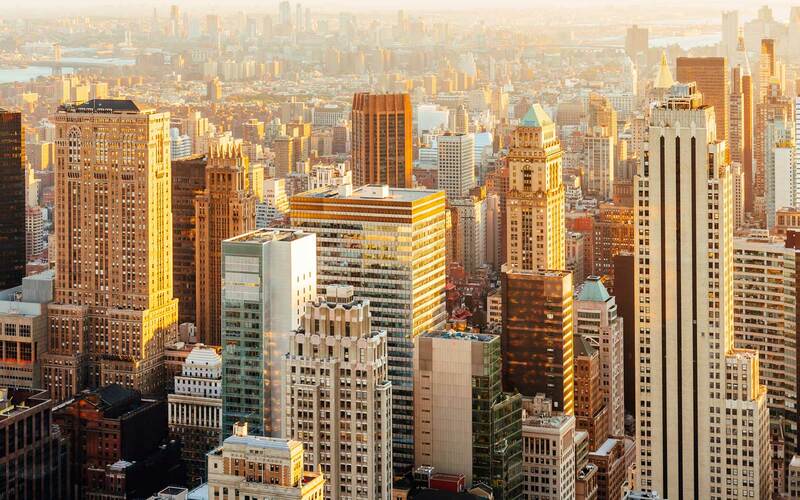 The city rewards a longer stay than most visitors budget. Once you’ve taken in the Renaissance masterworks, spend a few days exploring the overlooked corners and outer neighborhoods. There are no direct flights from the U.S. to Florence, but multiple carriers offer connections from European hubs, including Paris and Amsterdam. Though taxi stands abound, one of the pleasures of Florence is that you can get just about everywhere on foot. Staying at the Four Seasons Hotel Firenze (doubles from $1,000) was one of the highlights of my trip. Occupying a 15th-century palazzo, the hotel was a lavish, private oasis after a day spent exploring the city. The properties operated by the Lungarno Collection offer a more modern take on luxury. The coolly minimal Gallery Hotel Art (doubles from $344) is profusely decorated with contemporary sculpture and photography, while the Continentale (doubles from $370) channels mid-20th-century Italian design. After years of being regarded as behind the curve, Florence’s dining scene has evolved into one of the most compelling in Italy. At Ciblèo (prix fixe $62), Fabio Picchi, the city’s undisputed culinary king, serves up an omakase-style mix of Italian, Japanese, Chinese, and Korean tapas. La Ménagère (entrées $17–$34) is a beautiful, airy space with fine dining in the rear and a casual bistro up front, as well as a florist and a small shop that sells home goods. The Oltrarno neighborhood’s casually hip dining scene is anchored by Il Santo Bevitore (entrées $10–$30), where refined takes on Italian classics are served in a cozy space. An adjacent wine bar, Il Santino, offers small bites to a boisterous crowd. I particularly enjoyed the inventive menu at Gurdulù (entrées $22–$42, tasting menus from $65), a stylish spot out of a Fellini film. For cocktails, there’s no better place than the rooftop bar of the Continentale, with its sublime views of the terra-cotta skyline. A trip to Florence isn’t complete without a visit to the Uffizi Gallery and a pilgrimage to see Michelangelo’s David at the Galleria dell’Accademia. Thankfully, the city has launched a new website, destinationflorence.com, to make the ticketing process less chaotic. If you feel overwhelmed by the crowds, head for the Palazzo Strozzi, the city’s contemporary art foundation, or the Gucci Garden, where a history of the brand sheds light on Florence’s role as the birthplace of modern Italian fashion. 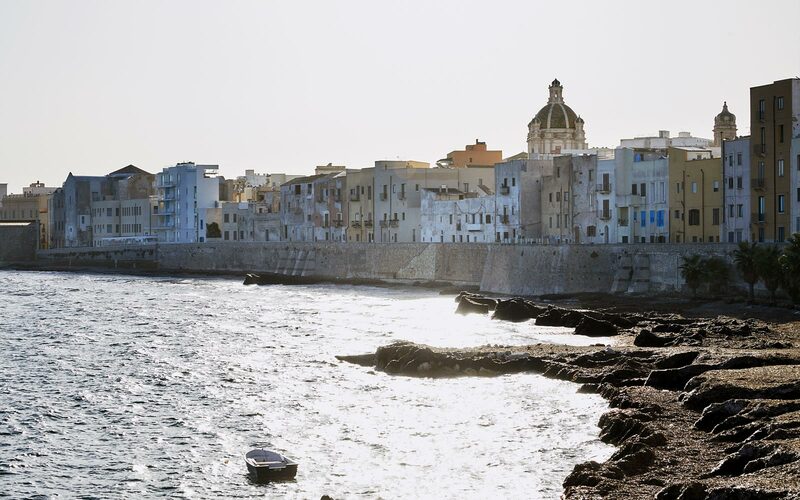 For a glimpse into the city’s new creative scene, check out Numeroventi, an artists’ residency in an old palazzo that opens its doors for monthly exhibitions. Mortegan, a leather-goods atelier in Oltrarno. Oltrarno has long been home to Florence’s craftspeople. 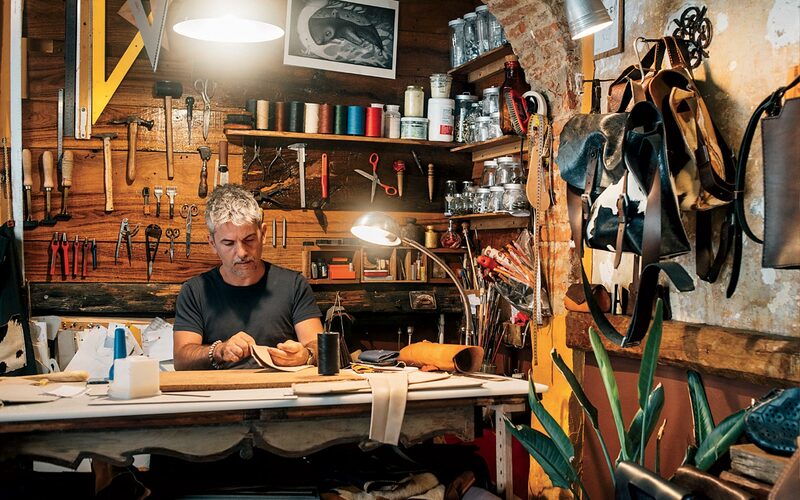 Seek out Mortegan, maker of exquisite leather goods, and Bartolozzi e Maioli, a wood-carving studio that has produced intricately detailed sculptures for the past 80 years. New boutiques have started cropping up in the area. My favorites were Campucc10, which showcases objects and prints by local artists, and Giulia Materia, where the stock ranges from clothing to notebooks bound in vintage wallpaper. If you’re looking for high-end women’s shoes, visit Aquazzura. Rising star Edgardo Osorio conceives his collections in the studio above the store. Content for this story was produced with assistance from Four Seasons Hotels & Resorts and the Lungarno Collection.